This was a fun dinner for the kids. I got everything ready and let them make their own Pizza Waffles! A couple of kids wanted pepperoni and one wanted just cheese. My only tip is don’t overfill the waffles. You’ll have a mess all over your counter! pizza toppings: pepperoni, sausage, peppers, onions, olives, etc. Spray waffle iron with non stick spray. 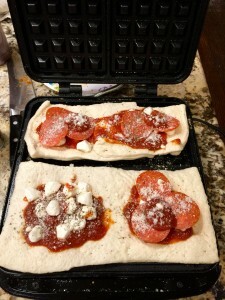 Place dough into the waffle iron, top with sauce, cheese, toppings. Add another layer of dough. 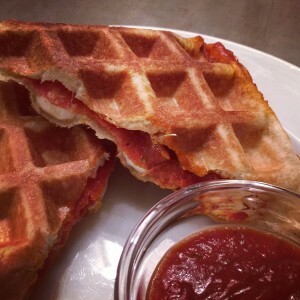 Close waffle iron and cook for 3-5 minutes, or until waffle is browned and crispy. Serve with a side of marinara. Copyright © 2016 Our Everyday Dinners - This is an easy recipe for how to make Pizza Waffles.